Coveted by every film director on the planet, the Palme d’or yearly honours the best film of the Cannes Film Festival. Redesigned in 1998 by Caroline Scheufele, it has since become a radiant symbol of a love story uniting Chopard with the most glamorous film festival in the world. A testimony to the Maison’s commitment to sustainable luxury, the Palme d’or is meticulously made each year with Fairmined-certified ethical gold in its Haute Joaillerie ateliers. This year brings a first, since in addition to the Palme d’or, the workshops of the Maison will produce every single trophy to be presented at the Cannes Film Festival closing ceremony, making Chopard the artisan of all these official prizes that catalyse such a wealth of emotions. Shining more brightly than ever and radiating a new aura, the legendary film-making distinction will once again be the object of every desire following the prestige of the Red Carpet Collection. It all began in 1997 when Caroline Scheufele, Co-President and Creative Director of Chopard, met Pierre Viot, then director of the Cannes Film Festival. 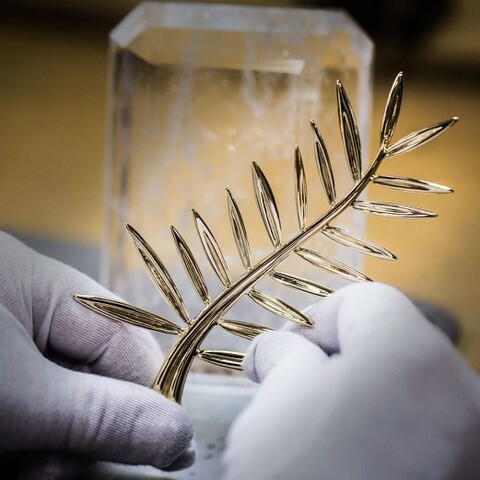 While she was attentively examining the trophy displayed in Pierre Viot’s office, he invited her to redesign a fresh interpretation of the Palme d’or. For this keen film-lover, it was a new challenge that she took up with great enthusiasm, devoting her boundless inspiration and creativity to one of the film industry’s most sought-after awards. The following year, at the closing ceremony of the 1998 Cannes Festival, the new Palme d’or was unveiled to the world in the form it still takes to this day. Ever since, Chopard and the Cannes Film Festival have formed a glittering relationship: “It’s a magnificent historical partnership. As I used to say to Gilles Jacob, we have become a fixture… just like the red carpet”, says Caroline Scheufele with a smile. In addition to the Palme d’or and its two miniature versions awarded for Best Actor and Best Actress since 2000, this year the Maison’s ateliers will be producing – for the first time – five mini-Palmes intended for the recipients of the “Grand Prix”, “Best Director”, “Best Screenplay” distinctions, the “Jury Prize” as well as the “Short Film Palme d’or” awarded by the Cannes Film Festival jury. Up until now, winners of these five prizes have been awarded with a diploma. Designed in Chopard’s Geneva jewellery ateliers in 1998, the precious palm is every inch a High Jewellery creation.The Palme d’or, whose motif is a direct nod to the palm trees lining the famous Croisette and to the Cannes coat-of-arms evoking the famous legend of Saint Honorat, is made with 118 grams of Fairmined-certified ethical 18-carat yellow gold. As if ruffled by a gentle breeze, its exquisite leaves appear to have settled for a brief moment, while the base of the branch forms a small heart, a tribute paid by Caroline Scheufele to a beloved symbol of the Maison, the Big-Hearted jeweller. Finally, the Palme d’or rests on a dainty rock crystal cushion shaped like an emerald-cut diamond. This ultimate detail makes each trophy truly unique, since nature never yields two identical rock crystals. Five Chopard artisans devote no less than 40 hours to hand-crafting the Festival’s most coveted treasure. For several years, Chopard had been demonstrating its commitment to corporate responsability, placing it at the very core of its values. A member of the Responsible Jewellery Council (RJC), which plays a leading role in establishing environmental, social and ethical standards, the Maison has created in conjunction with Eco-Age founder, Livia Firth, a programme named The Journey to Sustainable Luxury. First launched in May 2013 at the 66th Cannes Festival, this broad-scale project takes the form of significant projects aimed at fostering the development of sustainable luxury.The Green Carpet Collection see also the light of the day the same year. The Swiss watchmaker-jewellery thereby undertakes to source its materials from suppliers openly justifying responsible practices on both social and environmental levels. The creation of a Palme in “Fairmined” gold bears further testimony to Chopard’s commitment to sustainable and responsible luxury.